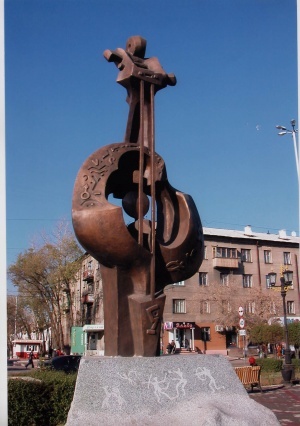 The Kobyz (Template:Lang-kk) or kyl-kobyz is an ancient Kazakh string instrument. It has two strings made of horsehair. The resonating cavity is usually covered with goat leather. 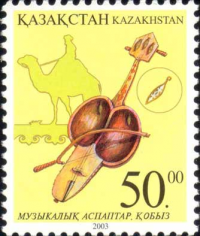 Bowed instruments may have originated in the equestrian cultures of Central Asia, an example being the Kobyz (Kazakh: қобыз) or kyl-kobyz is an ancient Turkic, Kazakh string instrument or Mongolian instrument Morin huur:Turkic and Mongolian horsemen from Inner Asia were probably the world’s earliest fiddlers. Their two-stringed upright fiddles were strung with horsehair strings, played with horsehair bows, and often feature a carved horse’s head at the end of the neck. ... The violins, violas, and cellos we play today, and whose bows are still strung with horsehair, are a legacy of the nomads. It is believed that these instruments eventually spread to China, India, the Byzantine Empire and the Middle East, where they developed into instruments such as the erhu in China, the rebab in the Middle East, the lyra in the Byzantine Empire and the esraj in India. The violin in its present form emerged in early 16th-Century Northern Italy, where the port towns of Venice and Genoa maintained extensive ties to central Asia through the trade routes of the silk road. The modern European violin evolved from various bowed stringed instruments from the Middle East the Byzantine Empire. It is most likely that the first makers of violins borrowed from three types of current instruments: the rebec, in use since the 10th century (itself derived from the Byzantine lyra and the Arabic rebab), the Renaissance fiddle, and the lira da braccio (derived from the Byzantine lira). One of the earliest explicit descriptions of the instrument, including its tuning, was in the Epitome musical by Jambe de Fer, published in Lyon in 1556. By this time, the violin had already begun to spread throughout Europe. This page was last modified on 3 May 2017, at 19:00. This page has been accessed 2,704 times.